​For more than 40 years in Alaska, Jo and Peter Michalski have followed their motto to “give where you live” - leading the way in philanthropy, fundraising, and service. Jo and Peter demonstrate a shared commitment to “Tikkun Olam,” making the world a better place. Jo and Peter both hail from Minnesota, and met while attending the University of Minnesota. Their lifelong partnership began when a mutual friend invited them to the theater (Jo’s first and only blind date). Jo and Peter married in 1969 and moved to Alaska in 1971, after Peter completed his law degree. Peter’s legal career led to an appointment as Superior Court judge, while Jo became one of the most successful businesswomen in the state. Since they retired, Jo and Peter have stepped up their volunteer efforts, supporting the arts, education, and community development. They have two sons, Matthew and Nathan, both attorneys and living in Anchorage with their families. Two brothers from Moldova have also become part of the family: Dorin and Adrian Parasca, who came to the Michalskis as exchange students and are now living in Chicago and Charlottesville. Jo’s mother set the stage for her four children to aim high. In an era when women rarely worked outside the home, Jo's mother served 5 years as a captain in the Women’s Army during WWII, followed by 20 years in state and national politics. Jo demonstrated her own gift for leadership and civic involvement early in life. In high school, Jo was the first female to be elected president of the student council and chaired the Minneapolis/St. Paul Joint Student Council. As the teen representative of Dayton’s Department Store (now Target), Jo won the Bobbie Brooks Scholarship contest and was featured in Life Magazine. After graduating from the University of Minnesota, Jo taught high school Social Studies while Peter completed his law degree. She continued her teaching career in Juneau, working to develop a statewide environmental education curriculum. For three years, she conducted teacher workshops throughout the state and organized the first Governor’s Conference on Environmental Education. In 1976, Jo earned her Masters’ degree from the University of Alaska-Fairbanks, with a plan to become a high school principal. That plan changed when sister Jana Hayenga moved to Anchorage in 1979. The sisters joined forces to open a series of successful Anchorage retail stores: Country Classics, Classic Toys, Alaska Book Fair Co., Once Upon a Time, and Flypaper. On her own, Jo founded Classic Woman and Portfolio. ​Jo advises others to “start small, think big, move fast” – and give back to the community. “Being in business has been good for me, as it provided … control over my life to raise my family, to participate in the community and to do what I could do to leave this world better than I came into it.” In addition to providing jobs and filling retail needs in the community, Michalski is committed to educating and encouraging young entrepreneurs. She is a valued contributor to women’s conferences, focusing on women’s issues in the workplace. Her accolades include the 1997 Athena Award, 1998 Outstanding Small Business in Philanthropy Award, 1998 Woman Entrepreneur Award, 1999 Gold Pan Award for Outstanding Community Service, 2001 Women in History legislative citation, and 2016 Alaska Women’s Hall of Fame. Jo recently served as the co-Chair of the Alaska Community Foundation's Campaign for Alaska's Future, raising funds to strengthen communities and nonprofits across our state. Under Jo’s leadership, this five-year effort has raised $100 million dollars - double its original fundraising goal. ​Peter’s interest in Alaska was sparked early on by stories of his father’s military service in the Aleutians during World War II. Peter’s twin brother, cousin, and uncle also served in the military in Alaska during the ‘50’s and ‘60’s. When Peter saw the opportunity to interview with Alaska’s Department of Law, he jumped at the chance. With Jo all in favor of going off for an adventure, Peter accepted the offer of a job in Juneau. In August, 1971, they started off for Alaska in a Dodge Dart, camping in a pup tent most of the way up. At the end of his two-year contract, Peter told the attorney general, John Havelock, that he planned to go back to Minnesota to learn to try cases. John had other ideas. "We need people to try cases in Fairbanks. And we need someone to cover arraignments next week. Why not go up and see how you like it?" Peter did go, he liked it, and Jo was game for more adventure. 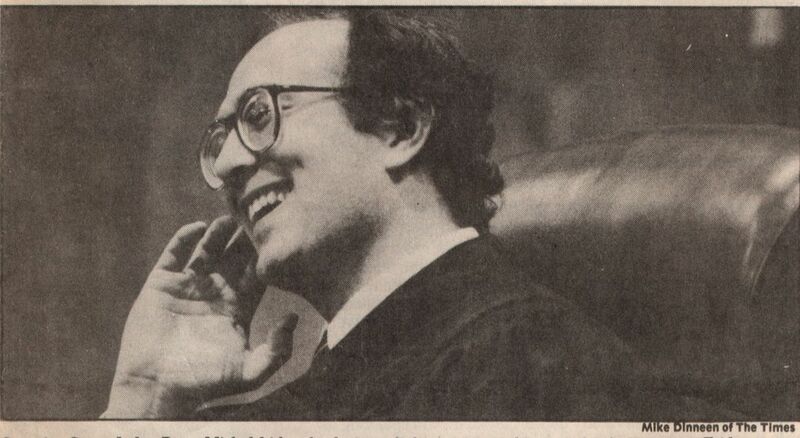 After four years in Fairbanks, Peter and Jo transferred to Anchorage, where Peter led the Office of Special Prosecutions and Appeals until he was appointed to the superior court by Governor Bill Sheffield in February 1985. He served as a Superior Court judge for the next 27 years. ​Since retiring in 2012, Peter donates much of his time and talent to helping non-profit organizations. He chairs the Alaska Community Foundation Board and works on its program and grants committee. A director of the Anchorage Museum Association since 2013, he recently joined the museum’s foundation board. The Michalskis donate generously, and frequently host events and fundraisers in their home. Jo and Peter contribute to the University of Alaska, the Anchorage Museum, the Alaska Community Foundation, YWCA, and more. In 2006 Jo and Peter jointly earned the Philanthropist of the Year Award from the Association of Fundraising Professionals (Alaska chapter).